Certification is not one of the C’s in the traditional 4 C’s, but it should be. Many dealers, whether in an actual store or an online dealer, carry diamonds that are certified by one of two authorities. These certifying authorities are the Gemological Institute of America, the GIA, or the American Gem Society, the AGS. With each diamond that passes through these organizations is a lab report that tells you everything about the stone. Most dealers will graciously let you see the report and most all online dealers will post the report. 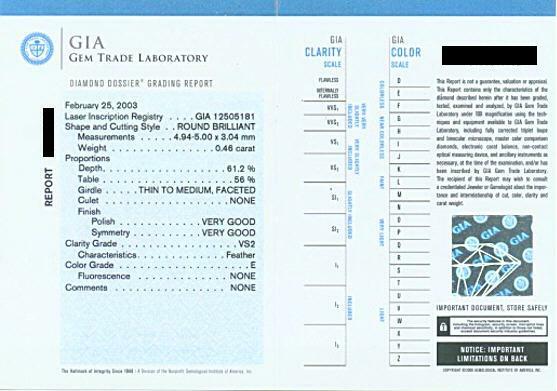 Below is an example GIA report. As you can see, many of the metrics discussed in the 4 C’s appear above in the certificate. In addition to the 4 C’s are scales and charts for reference to help decipher anything that is unclear. To help ensure authenticity, GIA laser inscribes their diamonds on the girdle with a number found on the certificate. One can actually see the number on the diamond with a microscope. I highly recommend getting a diamond that has a certification from a nationally known certification authority. Some dealers use their own system, that may be partial or biased, to certify diamonds . Also there are many criminals who would gladly sell you a fake diamond for full diamond cost. Look for the GIA, AGS, or other nationally known trademarks and you will always know exactly what you are getting. I put an invaluable trust in these documents as I bought my own wife’s wedding ring from Bluenile by looking at a certificate much like the one shown above. I was able to get a beautiful stone without even seeing it first. Upon arrival the stone looked perfect and I had the certificate that could be used for independent verification if I was not satisfied. In addition, this certificate can be used for insurance purposes if ever such a problem arose.